Summary: What if saying hello to an old friend meant saying good-bye to life as you know it? It’s been six years since Pen Calloway watched her best friends walk out of her life. And through the birth of her daughter, the death of her father, and the vicissitudes of single motherhood, she has never stopped missing them. Pen, Cat, and Will met on their first day of college and formed what seemed like a magical and lifelong bond, only to see their friendship break apart amid the realities of adulthood. When, after years of silence, Cat—the bewitching, charismatic center of their group—e-mails Pen and Will with an urgent request to meet at their college reunion, they can’t refuse. But instead of a happy reconciliation, what awaits is a collision of past and present that sends Pen and Will, with Pen’s five-year-old daughter and Cat’s hostile husband in tow, on a journey across the world. I'm finally getting around to reading many of the books that I collected at this year's BEA. And that's quite a feat for me since I still have books from the 2009 BEA in my basement! One fall book that I was particularly excited about was FALLING TOGETHER by Marisa de los Santos. I adored her last novel BELONG TO ME (my review) and I even loved the guest post she wrote for my blog. I even had the opportunity to meet her and talk with her for a few minutes, and she was everything I expected -- cute and sweet! Since I did enjoy BELONG TO ME so much, I was a little bit concerned that FALLING TOGETHER wouldn't live up to my expectations. While I did enjoy FALLING TOGETHER, I can't say that I did appreciate it as much as her last novel. That's probably an unfair comparison, though, since I thought BELONG TO ME was stellar. It's not that FALLING TOGETHER wasn't well written with interesting characters, because it was. I just don't think I liked and related to these characters in the same way that I related to Cornelia. I have seen a few reviews from other bloggers who also loved BELONG TO ME, and I think quite a few of us had similar reactions. However, don't let that deter you from picking up this novel. There are many wonderful qualities to FALLING TOGETHER and I think most people who enjoy women's fiction will enjoy this story. FALLING TOGETHER is a touching story about love, loss and, most importantly, friendship. FALLING TOGETHER explores the relationship of three college friends, Pen, Cat and Will. The book begins six years after college graduation -- when the three are no longer friends. When Pen and Will receive a message from Cat asking for their help, they immediately rush to her aid only to find that things with Cat definitely aren't what they seem to be. It is through a reflection of their past and present lives that these three individuals discover not only things about their relationship, but also many important things about themselves. I thoroughly enjoyed the way that FALLING TOGETHER unfolded, and that's a credit to the author. In many ways, this book was almost a mystery -- both for Pen and Will as well as the reader. Pen and Will were searching for Cat in addition to trying to understand what happened in her life. In addition, the reader is kept in the dark about why the friendship ended. Through the use of flashbacks, both mysteries are eventually revealed. Once again, I have to give Ms. de los Santos credit for creating three very dynamic (and interesting) characters. She truly knows how to bring memorable characters to life. I found each of these characters to be extremely complex, and at the same time, very flawed. I'm thinking those flaws are what made them so interesting! I didn't agree with many of their actions, but I did appreciate how they each evolved while they were best friends. And at the same time, I enjoyed seeing how they grew when they were on their own... without each other. While I did enjoy getting to know each of them (notice I didn't say that I liked all of them! ), I most appreciated how FALLING TOGETHER delved into the nature of relationships, and especially how it explored those ties that keep up together... and apart. Ms. de los Santos truly has a gift of capturing the intricacies of human nature and relationships, and she definitely gave me some food for thought with this novel. I do think FALLING TOGETHER would make an interesting book club selection. The characters in this story -- Pen, Cat, and Will -- are all interesting in their own right. In addition, the dynamics between the characters, both during their college years as well as now, are incredibly complex. There is a reading guide available which has thirteen thought-provoking questions. Some of the themes you might want to discuss include friendship, love, identity, father issues, loss, parent/child relationships, forgiveness, family, grief, commitment, and acceptance. I do appreciate that many of these themes are universal to all of us and, therefore, should generate a lot of discussion. 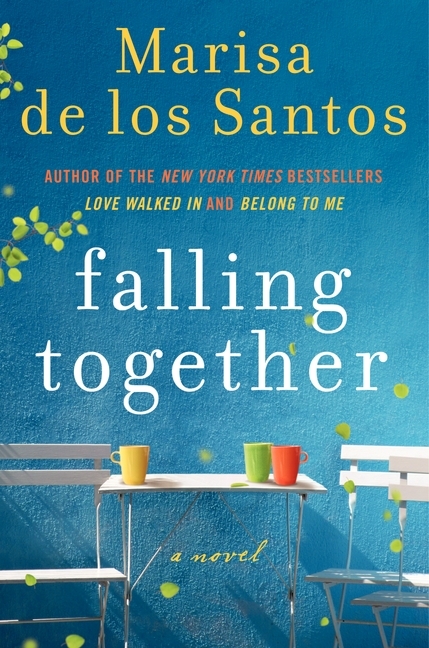 I enjoyed FALLING TOGETHER a great deal and I definitely recommend it to fans of Ms. de los Santos' as well as fans of women's fiction. I am so excited to get my hands on this book! I really enjoyed both of her previous books! I think I have her previous books in the house. I'll start with those and then move on to this. Poor Marisa de los santos - her first two were so good it's hard for her to live up to them! It does seem to be the consensus that this book isn't as good as de los Santos' first two books, but it still sounds like it's pretty darn good to me! I haven't read anything by this author, but if/when I do, I will start with her previous books first. And don't feel bad about the BEA books...I haven't read all of mine either! I have not read any of this author's books before. Thanks for the review. I loved Belong to Me. I can't wait to read this one. This one just arrived in my mailbox and I'm so looking forward to opening it soon....especially after your review! I'm looking forward to reading this. I have liked her previous novels as well - thanks for sharing your review!